Rodrik Harlsjen has never shown any inclination for the subtlety of magic and politics, although he could count a score of ancestors in the inner circle of the Gilded Hand. And yet, he now sits at their inner councils as their foremost military advisor. He rose to prominence at the head of his own Free Company, Rodrik's Valiants, during the final stages of the Season of War. In a series of running skirmishes, the Valiants hunted down the plague-ridden servants of the Horned Rat that had infiltrated the Pen, the shanty town were merchants grots, mercenary orruks, maneaters and other unsavoury but useful types are confined by order of the Gilded Hand. Over the following months, Rodrik's men one by one fell to unknown diseases. But their captain's skills at inspiring a rowdy bunch of militiamen recruited from the populace of inner Venithya did not go unnoticed. 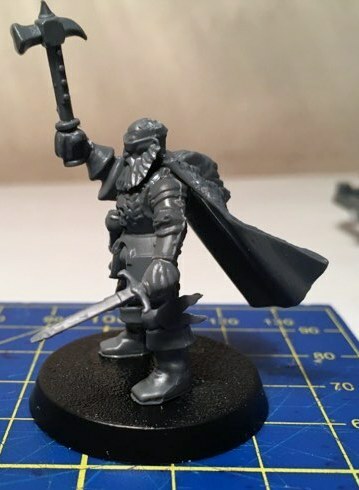 In the years to follow, Rodrik was tasked to lead both small and large armies and has secured new trade routes, cleared pockets of Chaos worshippers and repelled marauding orruks more than any other general in the payroll of the Gilded Hand. 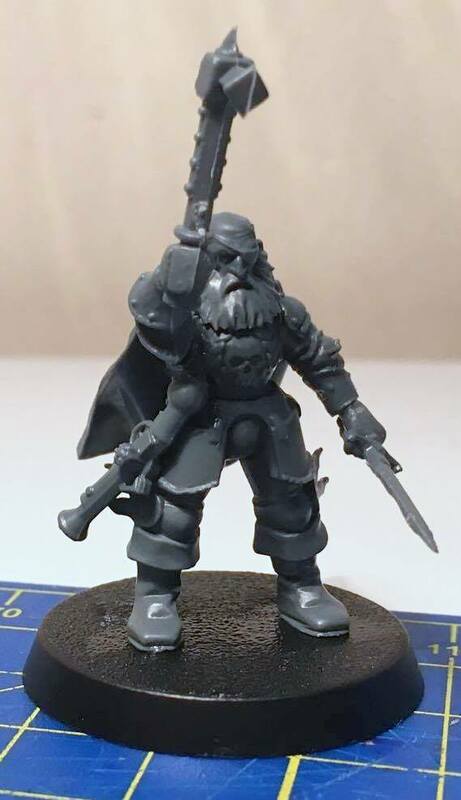 As the Season of Woe begun, the old veteran was quick to realise that the unquiet dead were the real threat and made sure that all men under his command were ready to fight such an unnatural enemy. It was this foresight, and his unparalleled skill to inspire the soldiery by fighting in the first line, that earned him the title of Lord Captain and his position within the Gilded Hand. As magic itself seems to be dying in Chamon, the alchemists of the Gilded Hand trust that Rodrik will keep their mercenaries as an effective bulwark against any force menacing Venithya. The inspiration for Lord Captain Rodrik comes from both the cover of the Dogs of War Army Book and the model of Roderigo Delmonte, Captain of the Alcatani Fellowship. 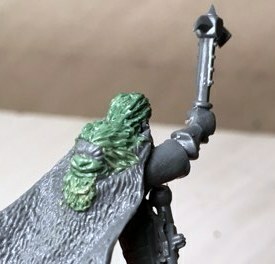 The body of the Freeguild General on foot was already perfect to represent both the model and the illustration. The kit also comes with a nice head with an eye patch. 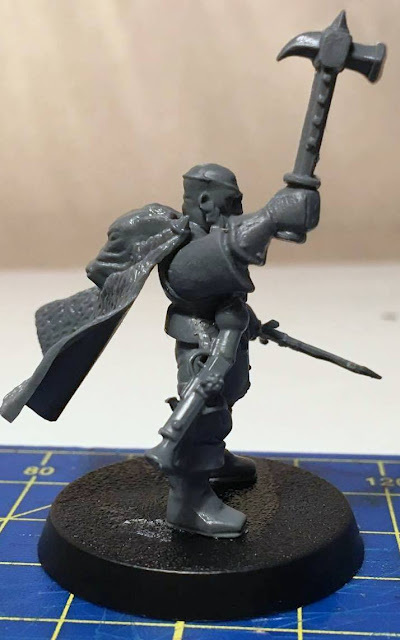 For the arms, I used one with hammer from the old Empire Knights of the White Wolf, while the one with dagger is from the Empire Militia with a hand swap and a dagger from the Freeguild Handgunners. 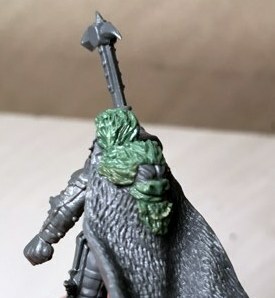 Finally a pelt, again from the Knights of the White Wolf, and a pistol from the Duardin Thunderers completed the base model. Of course, the pelt is of a wolf, while I wanted to have a lion, and the head is bald, while I needed long flowing hair. That's where the Green Stuff came handy. The hairs were easy. The lion's head required trimming down the long snout of the wolf and then resculpting the details. In the end , the lion looks like one of those you see in Buddhist temples, but that's fine! 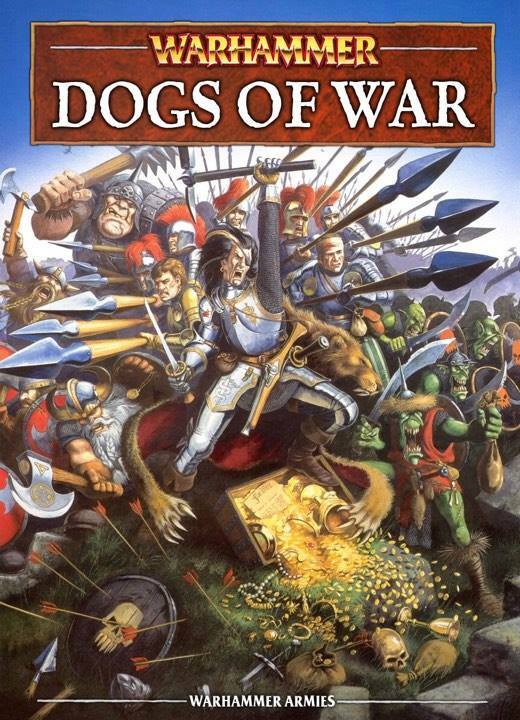 All kind of animals exist in the Mortal Realms, right? When it came to paint the model, I kept the dark copper of Roderigo, but turned it into burnished gold. together with the red on the clothing, this ties Rodrik with my other Freeguild Captain, Aldrik Tarsyn. From the illustration, I kept the streak of blonde hair, but turned it white. I reasoned that, together with the beard, this would be a nice hint at the time that has passed for that character. Think of it, that illustration is now twentyone years old and the World-that-Was is no more...it would be strange if the character still looked the same. Because of the golden armour, painting the lion pelt in natural browns will have created no contrast, so I went for a black and white striped pattern. This also allowed me to differentiate between Rodrik's hair and the lion's mane. With him, my Free Companies are almost done. There is just one more companies on the painting desk. Stay tuned, as I want to finish them before the new edition hits us!